The article “Reinventing Pakistan” is written by a well-known Pakistani nuclear physicist and political defense analyst, Pervez Hoodbhoy. It was published in DAWN newspaper on March 23rd, 2010. Pervaiz Hoodbhoy is the professor of high energy physics and head of physics department in Quaid-e-Azam University, Islamabad. Hoodbhoy is also a noted environmental and social activist and regularly writes on a wide range of social, cultural and environmental issues. He is the chairman of a non-profit organization Mashal, which publishes Urdu books on women’s rights, education, environmental issues, philosophy, and modern thought. He is an advocate for democracy in the country and a staunch opponent of militant Islam in Pakistan. The article is basically focusing the problems that Pakistan has been facing about its integrity and unity since independence. Writer is of the view that Pakistan has been a state since 1947 but has not been able to become a strong nation or even a nation. Missing is a strong common identity, mental makeup, shared sense of history, and common goals. He says that Punjabis prefer Pakistan over their province but people of Sindh, Balochistan and NWFP do not have the same approach. He also exemplifies the separation of East Pakistan. Then he discusses certain factors involved in making Pakistan a weaker nation. He criticizes the inequalities on economic and social basis, conflicts on ethnic and sectarian grounds, disloyalties and inefficiencies of leaders and the wrong use of religion by some people. Then at the end he gives several solutions to overcome these problems and make Pakistan a stronger nation. The article overall goes well and manages to keep the attention of reader throughout it. Testing and researching on something is known as experimentation. For centuries people have been testing and experimenting medicines on animals for the cure of certain diseases and then to apply the results on human beings. This approach is more traditional and less scientific in its behavior. Animal testing is a doubtful, inefficient and more or less a cruel technique. Whereas, non-animal techniques are more accurate, less time consuming and humane in manner. So, now the debate on this issue is increasing day by day and there is a number of doctors, scientists and researchers who tend to shift from these old techniques to more efficient, non-animal techniques. Animal testing has helped us in some of our researches but often it is misleading and less credible. Its failure outweighs its advantages and thus puts questions on its reliability. As new techniques are most logical so we should shift towards them. Scientific history tells us that animal testing was done widely all over the world. According to the Greeks’ writing animal testing was started in second century and Aristotle was the first who used animals for experimenting for the very first time. Galen used to dissect pigs and goats, today he is known as the father of vivisection. Other animals which were used for experiments are mice, dogs, cats, rats, files, monkeys, primates. Indus River Dolphin, also called Blind Dolphin is one of the world’s rarest mammals andthe second most endangered freshwater river dolphin. Approximately eleven hundred (1,100) individuals of this species now exist which is far less than their former number. The species is characterized by a long beak, rounded belly, very small dorgal fin and large flippers. These animals have a uniformly gray-colour pattern having a pale white or pinkish underside that gives a slight counter-shading effect. As this species matures, the melon becomes less rounded. The teeth are visible in both upper and lower jaws even when the mouth is closed. This species is called Blind Dolphins because their eyes are poorly-developed, they lack a crystalline eye lens but it still uses its eyes to differentiate between light and dark. The eyes are extremely small, resembling pinhole openings just above the mouth. 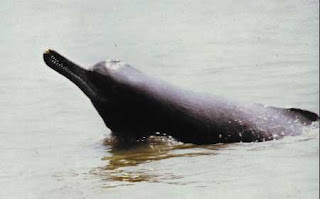 The Indus River Dolphin weighs 70-110 kilograms; maximum size is 2.5 meters (8.2feet). Their males are smaller then their females. A very unique feature of their swimming is their side swimming behavior. In its side swimming behavior, it enables itself to swim as shallow as thirty centimeters. As it swims, it trails a flipper along the bottom of the river. After thirty to sixty (30-60) seconds, when it needs to breath, it comes to the surface rotates upright to take in the breath and then as it swims back to bottom, it again rotates to ninety degree. This feature is not consistently seen in other dolphins except Ganges River Dolphin. Critical Analysis of "A Tragedy Born of Military Despotism and Anarchy by Tariq Ali"
Tariq Ali, a member of editorial board of New Left Review and author of dozens of books, wrote an article named as “A Tragedy Born of Military Despotism and Anarchy” on December, 28 2007, a day after Benazir Bhutto’s assassination. In this article he writes about Military Rule, its involvement in Benazir Bhutto’s assassination and the difference in Benazir’s views before and after becoming the first woman Prime Minister of Pakistan. He writes that an odd coexistence of Military despotism and anarchy created the conditions leading to her assassination in Rawalpindi. In past, Military rule was designed to preserve Law and order but today it is a cause of disorder and lawlessness in Pakistan. If we unveil those authorities who replaced major administration of Rawalpindi before PPP’s election rally in Liaquat Bagh on December, 27 2007, then we will easily disclose the truth behind the carefully organized killing of a major political leader and the identity of her assassins as well. According to the writer, some people assumed that the killers were Jihadi fanatics but the truth is yet to be revealed. Pakistan’s first Prime Minister Liaquat Ali Khan was also killed in 1953 in the same place and Zulfikar Ali Bhutto, father of Benazir Bhutto, became the victim of judicial murder under the oppression of Military in same city in April 1979. This death became a reason of bad relations between Pakistan People’s Party and the army in the coming years. Private military company (PMC) is a contemporary strand of the mercenary trade, providing logistics, soldiers, military training, and other services. Nevertheless, PMCs may use armed force, hence defined as: "legally established enterprises that make a profit, by either providing services involving the potential exercise of [armed] force in a systematic way and by military means, and/or by the transfer of that potential to clients through training and other practices, such as logistics support, equipment procurement, and intelligence gathering.” (Mercenary). Black Water is one such company that has gained fame due to its huge organizational structure and participation in many military operations throughout the globe. Black Water is world’s biggest, richest, deadliest and most powerful mercenary army, which operates from United States of America and even the world’s sole super power has not got any tangible control over this army. It is a private held company and does not publish much information about internal affairs. Black Water was founded by Erik Prince as a contracting security agency in late 1990s. He bought six thousand acres (twenty four square kilometers) of land in Great Dismal Swamp, North Carolina for this purpose. He named it after the peat-coloured water of the swamp. It now also owns an airport at its Moyock, North Carolina facility, called Black Water Airstrip Airport (NC61). Erik Prince was a former Navy SEAL who attended the Naval Academy, graduated from Hillsdale College and was later an intern in White House during George H.W Bush’s era. These days he is a major financial supporter of Republican Party and it’s candidates. The purpose behind the formation of Black Water was to provide support to military and train law enforcement agencies. It usually hires retired army men but even at times it inducts villains and criminals from around the globe. Especially it targets poor countries in Asia and Africa. It acts as an NGO or welfare organization in these countries and recruits people by luring to send them to the land of dreams; United States of America. Additionally, Black water consists of nine divisions. United States Training Centre (USTC, formerly Black Water Training Centre) offers tactics and weapons training to military, government and law enforcement agencies. Black Water Target System provides and maintains target range steel targets and a shooting house system. Black Water security consulting is one of the private security firms employed during Iraq war to guard officials and installations and train Iraq’s new army and police. Black water K-9 works in petrol capacities as war dogs, explosives and drug detection. Black water Airships, LLC was established in January 2006, to build a remotely piloted airship vehicles (RPAV).